Is it just me, or are Nook customer reviews somewhat lacking?
. . . at least, compared to Amazon review. DO NOT EVER LEND LendMe BOOKS TO NON- EXISTIENT PEOPLE!!!!!! NEVER EVER EVER EVER EVER EVER EVER EVER EVER EVER EVER EVER EVER EVER EVER EVER EVER EVER EVER EVER EVER EVER EVER EVER EVER EVER EVER EVER EVER EVER DO THAT!!!!!!!!!!!! The good news is that only three of out of 73 people (currently) found this review helpful. The bad news is that there are three people out there who found this review helpful. This was a weird book. It started out almost as if missing half of it or it was part 2 in a series. You just felt lost like they were talking about things that happened and you werent a part of it. There was no explanation for anything, while the premise might have been good, a little more explanation would have made this book much better. As is, it sucked. Woild not recommend at all. Terrible. Somewhere on this blog I’ve probably mentioned that I made a conscious decision not to give the backstory of the war in whose aftermath this story takes place. The war happened in someone else’s world; these characters inhabit another world altogether. If that doesn’t work for a reader, my apologies. If you’re a Free Fridays reader, all you’ve lost is your time. At least I can get some consolation from this. 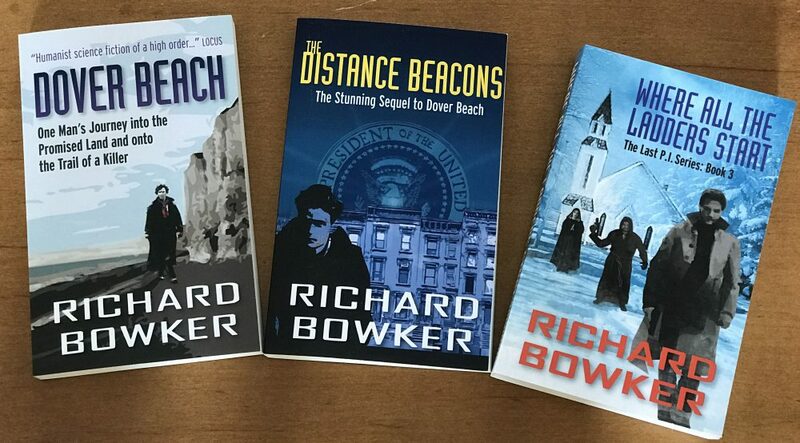 This entry was posted in Ebooks and tagged authors, book reviews, Dover Beach, ebooks, novels, science fiction, writing by Richard Bowker. Bookmark the permalink.